Free tool to send Outlook email message using the specified account, sender`s address, recipient lists, subject, message text, and file attachments. In addition, you can specify a, prepared in advance, Outlook message template in OFT or MSG format. 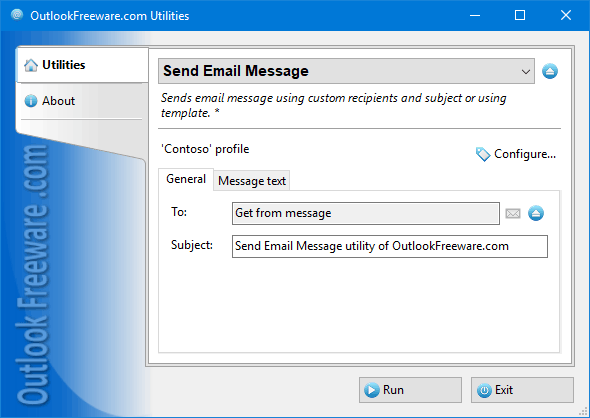 The utility sends an Outlook e-mail message using the specified account, sender`s address, recipient lists, subject, message text, and file attachments. In addition, you can specify an Outlook message template in OFT or MSG format. Sending emails in one action is useful in many cases. Even simply sending mail, based on Outlook templates, becomes much simpler; instead of a whole series of actions, it requires only a single mouse click. Hassle free email migration from Notes email client to Outlook client is only possible with result oriented Kernel for NSF to PST software.